Yep, can't sleep again. The culprit this time was a cup of orange pekoe tea too close to bedtime. Dang! And I was drinking it to wind down, too. Should've noticed this when I felt increasing inclination to keep reading my book (currently reading "The Broken God" by David Zindell), instead of putting it down. I suspect my engrossness in the book has also kept my mind alert and thinking. I really should read more trashy novels at night. Now I'm tired but still wide-eyed. I've read somewhere that an artist's style is unique like a personal signature or a fingerprint. Is this true? What about copied works of art? And also if an artist varies their work from one medium to another, say from paintings to collages to cartoons to sculpture. Can the same artist be easily identified in separate works from varied mediums? Okay, another old painting for you, since all my new ones haven't been photographed. 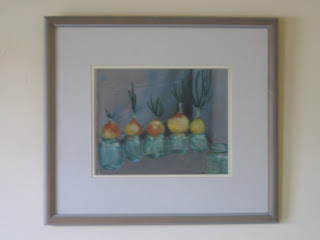 This about A4 size (canvas board) acrylic still life of onions growing on a window sill, based on a larger photo I cutout from a National Geographic magazine, which I cropped. This is about 16 years old, since I remember putting it together one summer on my bedroom floor just before I started first year university. It was also a very hot summer and the actual photo showed a winter scene of a city somewhere in Europe. The window sill was just in a small corner on the foreground. Back then I painted a lot on canvas boards because I was young, cheap and unemployed. I was also naive and didn't know to aspire to more quality materials, I just wanted to make art. Nowadays I use canvas board on small pieces which I work on at home. Since we live in a flat, space is always a premium and its been more so since the grubby bub arrived. We are swimming in baby junk and there seems to be traces of it in every room, even though I try to be tidy. Large stretch canvasses I use in the studio at art class, as I have the luxury of space there. In our next house, I'm already reserving the third bedroom to transform into a pseudo-studio space. (We'll keep a sofa bed in there for guests, too) But I'm now needing my own area to just mess about as I need. Can't really tidy away the bits and stuff that I look at everyday for inspiration.